This spring started off really slow, but is now really getting going. We are grateful for the warm days, sun and even the rain. 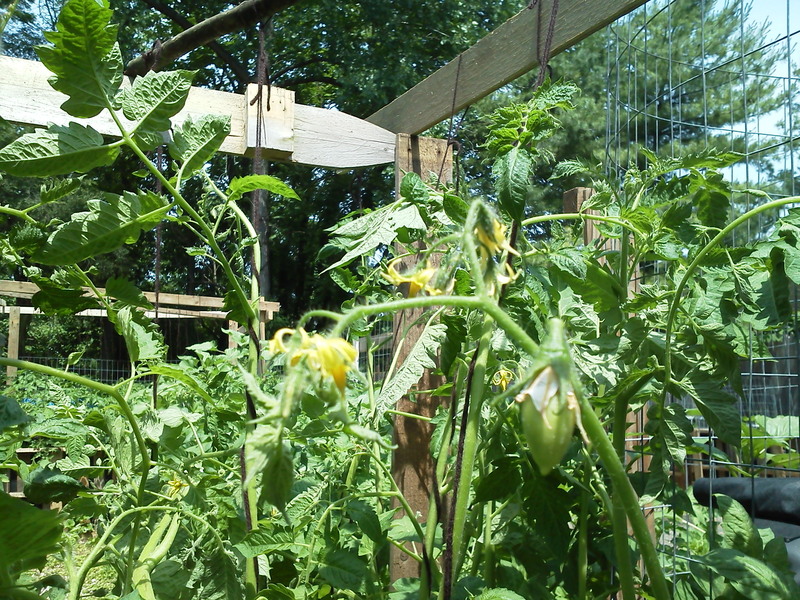 I have friends that make hay, they are not liking the rain, but my tomatoes are loving it. We expanded out garden this year, but did not add a lot of variety. We planted a couple different types of potatoes, tomatoes, beans, squash and melons… that pretty much takes up our whole garden. We do have smaller batches of lettuce, radishes, beets, carrots, cucumbers, strawberries, blueberries, brussel sprouts, and asparagus. We also have some stuff experimenting with in the aquaponics system. This is a picture of my little girls fort for the summer. 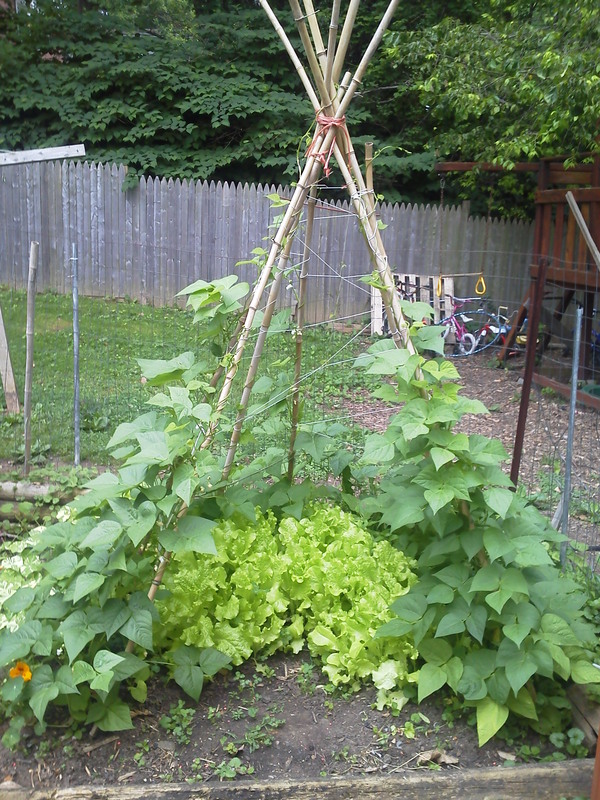 We are growing lettuce in the middle till the beans get nice and tall. It is doing really well, my daughter is going to be spending a lot of time in there this summer. This is one of my variety of tomato plants, san mazanos tomatoes. I was able to tie all of the plants up so that they can get the sun and rain that they need. These plants are really looking good! I love this upcycle. That is a broken window in the middle. 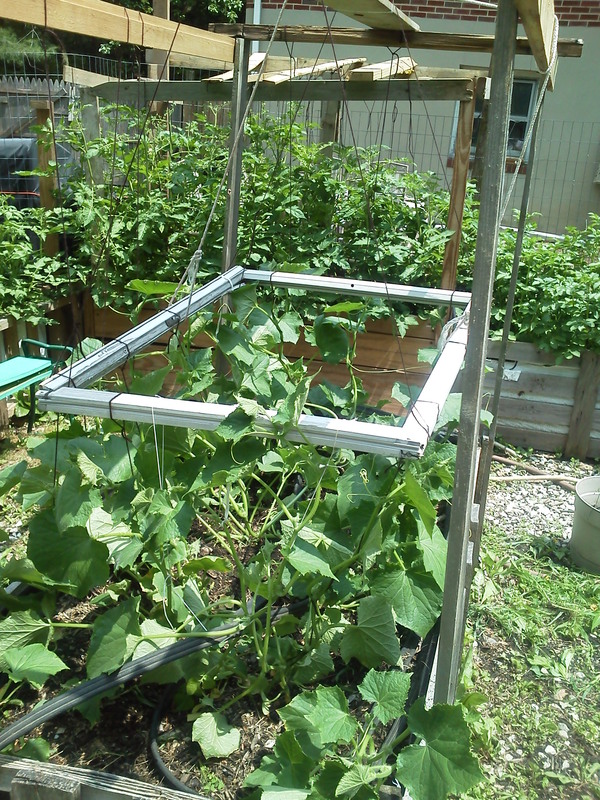 I hung it from the frame of my raised bed and tied my plants up so that they have tons of room to grow. I have flowers and some small cucumber buds. I can not tell you how much I love spring. Those are my tomatoes in the back ground. This post might be too graphic for young readers and those with a weak stomach. I will post the cute pictures first! Most days I really enjoy the animals that we raise and they bring me more joy than sadness. This morning however, was not one of those times. We have a doe that has been struggling as a mother. Aurora, we have learned, does not play well with others. For the last six months she has been living in our “Bunny Barn” with the rest of our rabbits. While in the barn, she was not being a very good momma rabbit. She would not put her babies in the nest, and she would not cover them up when it was 10 degrees outside. We lost a lot of babies this winter as the result of this. All of those babies were dead when we found them, it was sad, but there was not much that we could do. So we took the hint, and this spring we moved her out of the Bunny Barn. This was her last chance to prove that she could be a good momma. 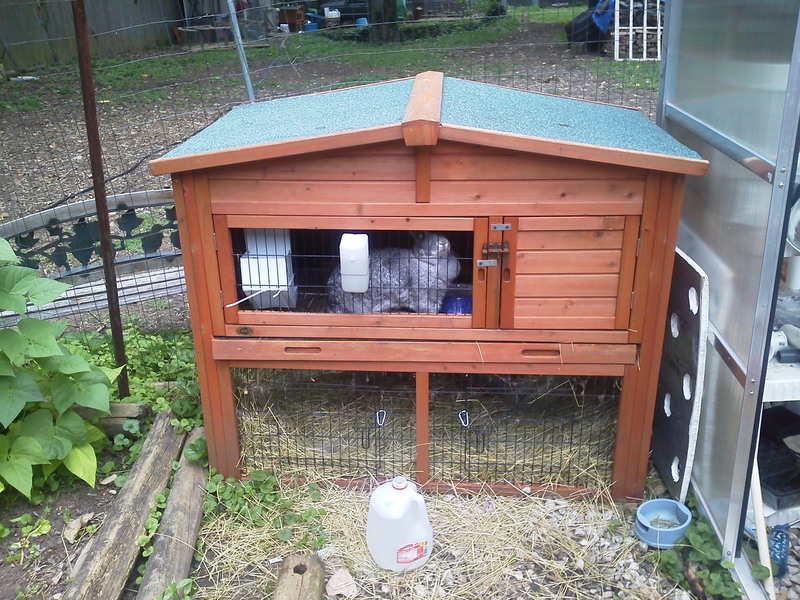 She lives in her own hutch that sits in my garden area, her new set up is in the picture above. She can see the whole yard, the dogs come and sniff her and the kids can poke at her more than they could in the Bunny Barn. However, even with all those stresses, she seems very happy in the garden. 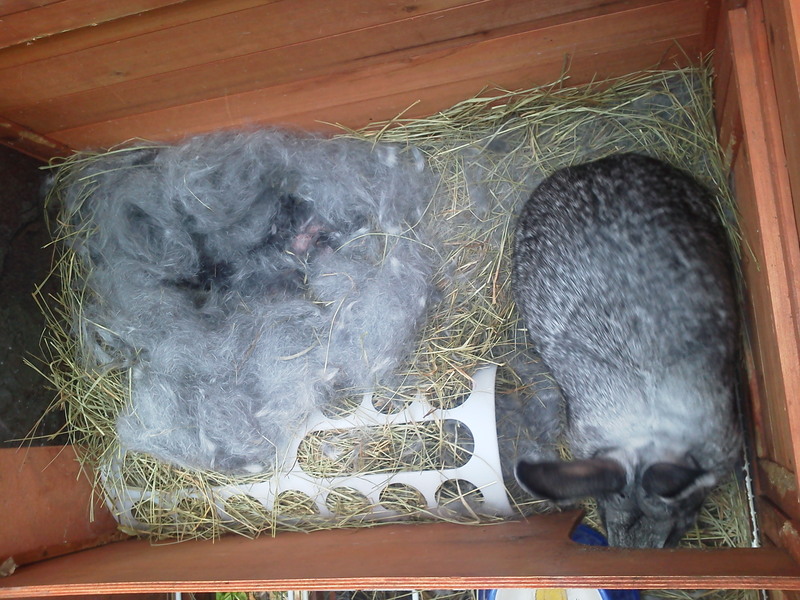 She kindled six kits early yesterday morning, she built an amazing nest and she pulled way more hair, than needed in June, to cover them up and keep them toasty. We were so proud of her. 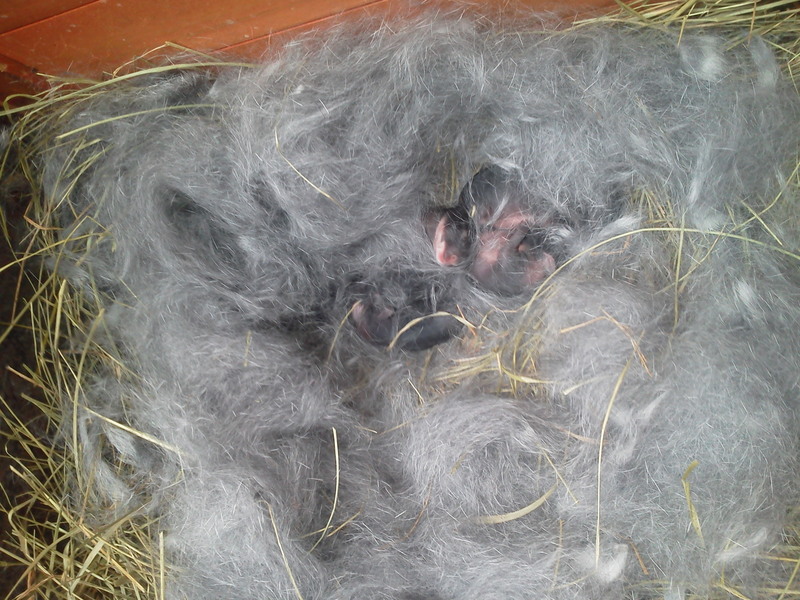 When I investigated the kits better to count them and remove any still born, my heart sank! 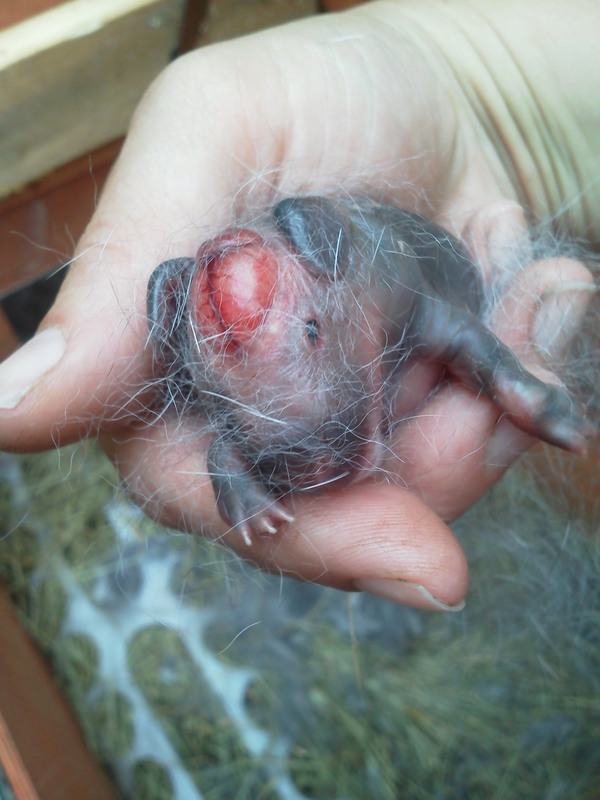 One of her little kits was born with no skull or skin covering up its brain. (I put at picture at the very bottom of the post). I called our amazing, trusty vet, and friend to ask if there was any hope of saving this little one. Sadly, the answer was no. Our baby had Encephalocele, this is a congenital birth defect that happens in gestation when there is not proper development of the nervous system. There was no way this rabbit could live for very long and it would suffer if it did live. So even though this was the most active kit in the litter, I had to humanly kill it so that it did not suffer anymore. Our kind vet suggested putting it in a bag and putting it in the freezer, even though it was not the fastest way, it was the most peaceful, the baby would just go to sleep. The other choice I had was to break its neck and that would have been even more difficult for me to do. At the end of the day, I am glad that the rest of the litter is still doing well. I am sad that we lost the one, but it is much better than losing all of them like we did this winter. I am happy to announce that Aurora is being a much better momma now, she lays in the door way to the nesting area and protects the babies. She built them an amazing nest, without a nesting box. I hope that other rabbit people are able to learn something from this sad story. I have been posting about my aquaponics system for a while. It has been a project that took a lot to get off the ground. We built the greenhouse, had to build the beds, find the tanks, order the grow media, order the pond liner… we have struggled with pumps, water pH, algae, freezing temps and many other hurdles. But finally we have tilapia in our system. We actually got the tilapia in the mail about a week ago, I took pictures and wanted to post about them right away, but I was really worried I would kill them all in the first week. Which would be so embarrassing to have to come back and write another post about how I really have no idea what I am doing. So I waited a week to post anything about the fish. The good news is that they are still alive, however I have realized I still have no idea what I am doing. Ok back to the fish, we ordered them from a hatchery in the mid west and they were shipped over night to us. They arrived in a foam cooler with a bag inside filled with oxygen. The first thing I did was open the bag and put an air bubbler in, thinking that was the smart thing to do. However, about 30 seconds after I did that my husband pointed out that was not what I was suppose to do and asked me if I read the instructions… which of course I gave to him to read so I did not have to. 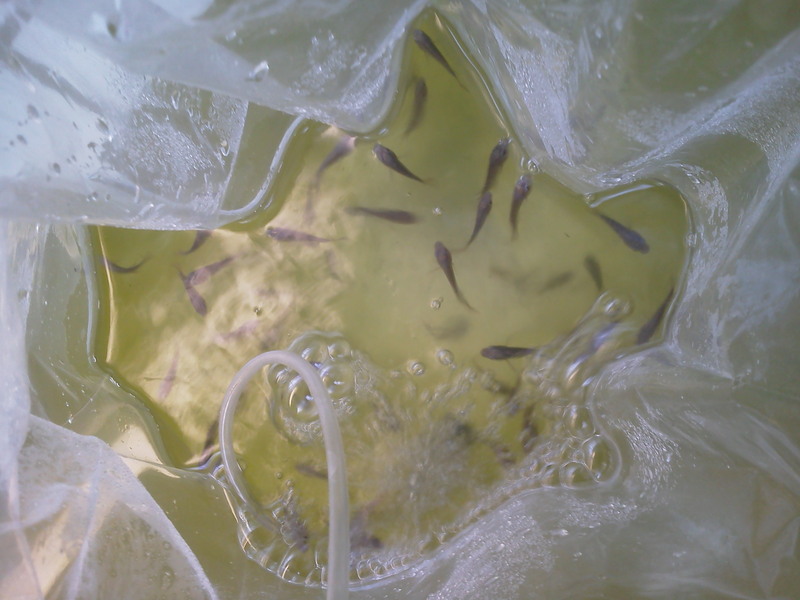 After letting the fish rest for a couple of hours we began adding a cup of our water to the water they were shipped in. We needed to get them adjusted to not only the temperature difference but also the pH difference. After a couple hours of that, we took their bag out and set it in our tank. This would better get them adjusted to our water temperature. After another couple of hours we put them into our tank and sat and stared at them for a while. Apparently, that was also in the instructions, or at least that was what my husband told me after we realized an hour had passed and we were still looking at fish. I am not sure if that was in the instructions or not, because I still have not read them. , we realized we need to do something about our algae problem. So we bought and installed a in-line UV filter… now the water is clearer and it is much easier to stare at the fish for hours. It really is relaxing, you should try it. In 9 months, I hope to be having a fish fry in the back yard to celebrate our aquaponics system! I had someone contact me looking for a buck. The email they entered on the contact page was not correct and I can not reply to them. If that was you, please recontact me… everyone else, here is an update about our buns. 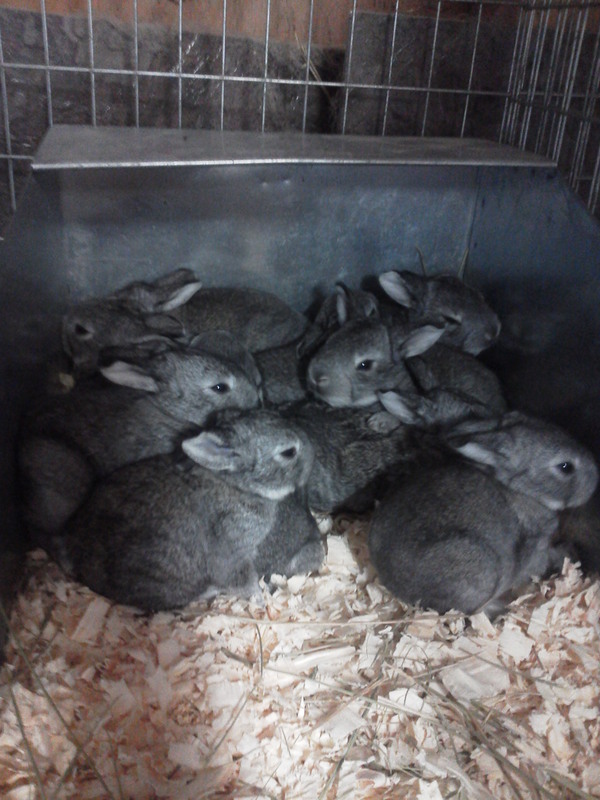 Our rabbits have had a good winter and a good spring. We have been selling trios to future homesteader and have really enjoyed getting to meet so many amazing people. I think that has become one of our favorite thing about our small little business. We are getting the chance to become apart of peoples lives. It has been great and we look forward to all the new people we get to meet in the future. Currently, we have three breeding does, one just had a litter of 10 weaned and the other two are pregnant and due within two weeks of each other. We have 2 bucks that are the main part of our herd that we just love to pieces. They are very social and love the attention they get from anyone that wants to rub their heads. We currently have 3 bucks that are for sale. They also have become love bugs are enjoy their hay and head rubs daily. We have moved one of our does into our garden. She did not like being in the rabbit barn with everyone else. She enjoys the personal attention she gets from me as I tend the garden and she really enjoys it when she gets clover or radish greens. I think she is going to become one spoiled bunny!